Here at THP we come across little gadgets available to us hackers that are designed to improve or help us with all aspects of our game. Recently THP received and sent out one of these gadgets to a few forum members to see if they worked for them as intended. The gadget? The Sure Putt from Sure Putt Golf. It claims to help you make more putts and thereby lower your score. Pretty simple and straight-forward but does it work? Check it out. Whether you’re a do it yourself-er or a HGTV addict, you’re probably familiar with a level. You know those things that tell you whether you hung your picture straight or not? Well the same premise is what the Sure Putt is based on. Put the Sure Putt down on the green and the bubble that’s inside the spirit will reflect which way the green is breaking. Can’t be that simple can it? Well it really is. It fits perfectly in the palm of your hand (not much larger than a standard paper weight) which means it’s super convenient, portable, but yet easy to read and use. Just tuck it away in your bag or pocket and it’s there until you need it. It’s extremely well made and has a certain ‘richness’ to it that doesn’t make it look or feel like you’re using a golf training aid. Testing this product was pretty simple and I went into the review period with the thought of ‘it’s only going to confirm what I already know.’ I like to think I know how to read greens and have been pretty good at it in the past. The Sure Putt confirmed this to a point but it also showed me how wrong I am on certain reads. When reading greens I can definitely tell where breaks are, the extent of them, etc but where I tend to struggle is where there is a change in slope on either an uphill or downhill. I would read the green and make my putt only to leave it 6” short or 4”long and wonder ‘how did that happen?’ Then I’d pull the Sure Putt out and see that I was misreading the green either short or long just as it was showing me, even if it was ever so slightly. Basically the Sure Putt is great for putts inside of say 10′ where it can show just enough of a variance that your naked eye may or may not be seeing. However I found that it was difficult to use when faced with a multi-break putt. It loses its convenience when you have to set it down to get a reading for the first part of the putt and then having to go put it down again to get a separate reading for the second part of the putt. If you can do this without walking in or through your anticipated line then you’re a better person than I am. If you struggle with reading greens or gauging speed for your putts than this little number may be your key to success. In the end I can see this being very useful which could always see some sort of value in using this product no matter how adept you become at reading greens. Because no matter how well we think we read greens, we never have those ‘I just don’t see it’ moments when trying to find the line of a putt right? The Sure Putt is available in a variety of colors (10 to be exact) and it’s even available in a variety of ‘themes’ (military, floral, etc). That’s pretty cool and may even make you want to use it that much more or not be embarrassed to use it around your buddies. Until you start rolling the rock into the cup more than they do. 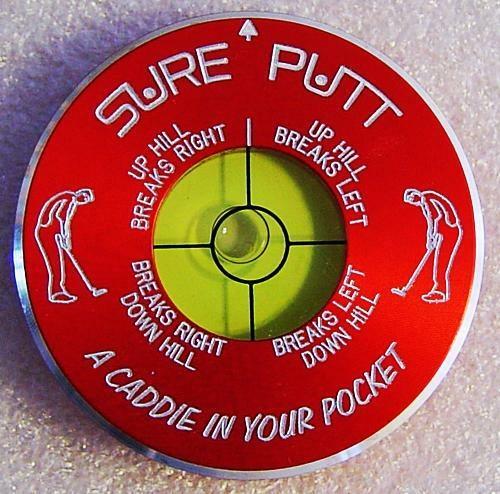 Suggested pricing for the Sure Putt is $39.99 which is pretty good considering the quality of this device. For more info on this handy little training aid, surf on over to their website and make up your own mind. Just think, if you become an expert at reading greens with the help of this device and find that you don’t need it anymore, you’ll always have a use for the Sure Putt. Hanging pictures around the house will never be more fun! Nice review. Very well written. great review Hanks! I like the concept of this device but the price tag is a little ridiculous in my opinion. Interesting. Nice thorough review. I can see the utility of the aid but $40 is a little steep in price. Of course, there is the cost of making it in all those colors and stamping, etc. Great review Hanks. Definitely seems like a cool gadget, but $40 does seem a bit steep. Will you be bringing it to the Outing? I’d love to see it in action. I really like the concept and would look into it but I find the price to be a little whack! Nice review Hanks. Interesting idea for a putting aid but looks like it would work. Nicely done. Love this review! I was really considering this device and I still am. The $40 is a bit tough to swallow but it sounds like it could pay out over the logn run. Great review Hanks! This little device intrigues me quite a bit, but I agree with the others that $40 seems kind of pricey. Seems like this is especially helpful for those very subtle breaks. Could be a good way to teach yourself to spot breaks that are tough to see. Gotta agree on the price. It looks very solid, but I couldn’t see myself getting one for that cost. Great info, T.
I was just on their website and it looks like they are running a special.. I saw the price to be $29.99??? Thanks for the review…$40 for that thing. Hmm, yeah I think I’ll stick to the old fashioned way of reading greens. My Android has a level ap that could do this exact same thing. Now that I have the idea, I’m going to try it out. Also, I’d like to see a picture of it next to something, a golf ball, putter, quarter etc. I’m not sure what a standard paperweight looks like anymore. Just go to your local hardware or camping store. Presto !!! Save yourself $35 bucks. The real question is, is it legal for use? Nice review but I gotta agree with those that posted above already, $40 is a bit much for this device. Good review, but I think the price is a little steep for what you get. Had my doubts about devices like this…this review has changed it. Thanks, Hanks. I actually bought one at the Chicago golf show last year and love it. It is small enough to keep in your pocket yet large and heavy enough to ensure a quality read. I think if it were just a level or made if plastic it would not sit well enough in the grass. This one is made out of metal and really does fee substantial. As for the price, come on guys, a dozen prov1 at 50 bucks. A new 56 degree wedge 125 bucks a chewed up prov from my wedge on hole three and I am marking a new 4 buck ball and looking at ob right and ob left with water short. A 15 buck six pack at the turn and a 5 buck hotdog. Golf is expensive. 40 bucks for a heavy piece of metal that I never have to replace and could help me make more putts and play better golf. Sold! I really do like mine, I gave a few out for Christmas… Good review, don’t let the price keep you away! How big is the thing. They dont even mention the size on their web site. This is at least the third generation of the same kind of device. Several years back, EyeLine Golf came up with one…Sam still has a basement full of them. Then there was another one that won the “product of the year” at the PGA Merchandise Show (because it had Butch Harmon’s picture on it) – and now this. I like it in theory, but in practice, it’s not a very usable product outside of a practice green. If you try to use it during a round, all you do is slow down play. If you use it to try to gauge a green before a tournament, you can REALLY stack up a course. In any case, you can’t use it during a round. I bet this would help… I may get one. Golf is an expensive game. If you can not afford $40.00 to improve your scoring – you may not need to be playing golf. The thing works great and the price is more than fair. I would give forty dollars to watch a monkey climb a tree. The thing is the size of a real silver dollar and about the same weight. I am making a lot of 10 foot birdie putts at my home course after practicing with it. If you can’t see forty dollars worth of value in this thing you probaly should take up another sport. You can pick up a pretty nice basketball for twenty bucks and play free all day. I bet you tight wads are the same guys that are to lazy to bend over and fix your own ball marks.